Zacharia Kahuno is arguably the oldest man in Kenya. At 112, the colonial civilservant is using his pension to pay for his granddaughter’seducation. As most centenarians sitpretty looking up to their offspring, Mzee Zacharia Kahuno Warugaiwhose age is estimated at 112 is using part of his pension to payschool fees for his orphaned granddaughter. The old man, who couldeasily pass for the oldest and active man in the country, has beenpaying school fees for the form three girl with the assistance of hisyoungest daughter since the girl joined form one. “Her mother passed awaya few years ago and her father is not quite able so when I heard thatshe had passed her KCPE, I decided to see her through secondaryschool,” calmly explained the old man as if that is what men of hisage do all the time. Just a day before wevisited him at his Ikinu farm in Kiambu last week, Kahuno had paidout Sh10,000 for the school fees while his youngest daughter wassupposed to top up with an equal amount. Kahuno who has only God tothank for his advanced age and good health clearly recalls the namesof the people who have recently visited him and even tells you whoamong his family members has neglected him and for how long. Believed to have been bornat the turn of the last century (1900), he told the Star that hisfirst encounter with the white man was at the tender age of betweensix and eight when he was employed a “lead boy” for cows thatharrowed the land at the Kiberenge (Mbo-i-Kamiti) farm. “I would lead the cowsthat were pulling the harrow while someone else pressed the harrow tothe ground to till the land. For this work I was paid three rupeesthat were equivalent to six shillings,” says the great grandfatherwho then lived with a nearby grandmother as his home was too far fromthe farm. He would much later beemployed at the same farm as a clerk whose work mainly involvedverifying the number of employees on duty, weighing harvested coffeeand at times helping the Mzungu in paying out casual workers. Heearned Sh30 per month. “We did not have manyexpenses and the money was practically sufficient for our needs. Iwould buy goats (at ten shillings each) and when I saved up to Sh60, I could buy myself a cow.” There was however no need to buyland at that time, as the clan land was still extensive and sparselyinhabited. “But later on when Ibecame a Christian (read enlightened) and as the population expanded,I saw the need to buy my own land here at Ikinu so that I could avoidthe crowding on my father’s land in Ting’ang’a.” He does notsay for how much he bought the land for or how big it is, onlyrevealing that the currency was goats with one goat being equivalentto ten shillings. Kahuno started his formaleducation at the mature age of 18 at Kambui, but later transferred toNgemwa in Ting’ang’a. At Kambui, a former First World War blacksoldier requested the Mzungu in charge to give him a teacher so thathe could start a school at Ngemwa. “At the end of 1918, ateacher was made available and six of us from Ting’ang’arelocated with him to Ngemwa to build and start a school. I vividlyremember us using the poles from my just deceased grandmother’s hutto put up the classroom.” Formal schooling in thosedays was synonymous with the teaching of the Christian faith and by1924, Kahuno was baptized at the Church Mission Society whichlater became the Presbyterian Church of East Africa. He would not talk muchabout the freedom struggle as he says those in government employmentwere not allowed to freely mingle with the rest of the populationduring the emergency, only saying how as a tax collector or courtclerk he used to visit settler farms to collect tax from the‘natives’. “Most of the time wewere in the office, but at month end we would visit Wazungu farms tocollect tax as they paid their employees,” says the man who thenlived in Starehe. Kahuno who has a problemremembering dates got married to his first wife while working withthe tax department, but she died in the early sixties forcing him tolater marry a second wife. “Following my baptism,I became a firm adherent of CMS and continued serving the church evenduring the emergency. I eventually got married in church to my firstwife Wanja”. The couple had sevenchildren, five boys and two girls, the same number Kahuno got withhis second wife Mwende, but hers were four girls and three boys. The CMS however did nothave provisions for church elders, and it was not until on retirementfrom the civil service in 1964 that Kahuno was made a church elder ofthe PCEA Ngemwa church. He retired from thisposition when his advanced age could no longer allow him to performchurch duties at the Nyagoti PCEA church near his home in Ikinu, buthe continues to be a strong adherent of the church. He can no longerattend church service but the mountain comes to him in the form ofpriests giving him the Holy Communion at home. The centenarian attributeshis many years on earth to blessing from God as he does not have aspecial diet, but until recently he used to walk for long distancesand has never gained weight. “I used to walk a lotand at one time as a colonial census enumerator in Kiambu, countedpeople on foot from Chief Kioi’s place (Dagoretti) to the ChaniaRiver.” That was the extent of Kiambu district then. Gituku who confirms thatno other Kimiri age group person is alive today clearly remembers howas a small boy, he was among those who marveled at Kahuno’s job asa clerk at a settler’s farm. The old man states as amatter of fact that his wives are now long gone, “but it does notdisturb me much as the children are there when I need them.” A relative told us how theold man had transferred his wealth to the second wife, believing thathe would die before her as he was much older but when she died aboutten years ago, he was forced to change his will again. On Tuesday, 24 January 2012, the Prosecutor of the International Criminal Court (ICC), Mr Luis Moreno-Ocampo, held a press conference in relation to the situation in Kenya, in the ICC’s Press Briefing Room. She has become a household name but she does not like it. Rebecca talks about stress for her and her family and how her freedom has changed. She wants her life to go back to normal. An Afghan mother has given birth to six children at a hospital in the northern city of Mazar-e-Sharif. The woman was not aware she was carrying more than one child and had not received fertility treatment. Doctors say the mother arrived in hospital on Monday and gave birth on the same day to three boys and three girls. It was her first pregnancy. Doctors say that having six children without fertility treatment is extremely rare. Afghanistan has one of the highest maternal and infant mortality rates in the world. 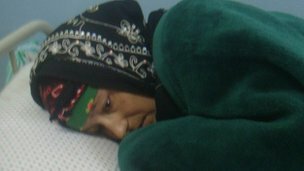 The mother, named as Sharah, 24, arrived in Mazar-e-Sharif hospital from a remote village in Balkh province. Provincial Health Director Mirwais Rabi told the BBC that all six babies are well but under-weight, with one only weighing about 700g (25oz). 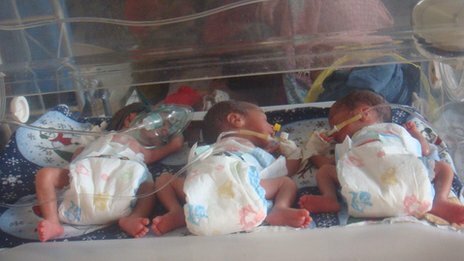 Mr Rabi said the sextuplets were being kept inside incubators and a special team of nurses and doctors are looking after them. The mother is said to be in good health but exhausted. Doctors say that had they been aware that she was carrying six children, she would have been in hospital at least several days in advance. The BBC’s Bilal Sawary in Kabul says Sharah’s story has made headlines on Afghan television and radio stations. A 2010 survey revealed that infant and under-fives mortality rates appeared to be decreasing. Experts say that despite recent improvements, Afghanistan remains one of the most dangerous places in the world to be a pregnant woman or a young child. One in 10 children in Afghanistan still dies before they are five years old, the survey said. Kenya’s deputy prime minister and civil service head will not have to resign despite a ruling that they will face trial for crimes against humanity. The attorney general said their future would be decided after the outcome of their appeal to stop the International Criminal Court trial from going ahead. 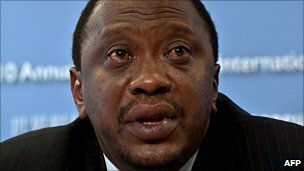 Uhuru Kenyatta and Francis Muthaura are among four prominent Kenyans the ICC confirmed on Monday would stand trial. All four deny their roles in the post-election violence of 2007-2008. Mr Kenyatta, son of Kenya’s founding President Jomo Kenyatta and a man who has been ranked as one of its richest citizens, and Mr Muthaura are accused of crimes against humanity, including murder and persecution. The pair are allies of President Mwai Kibaki, who appealed for people to stay calm after the ICC ruling confirming the charges. More than 1,200 people were killed in weeks of unrest between December 2007 and February 2008 and some 600,000 people were forced to flee their homes. Many still remain homeless. The violence began as clashes between supporters of the two rival presidential candidates – Raila Odinga and Mr Kibaki – but it snowballed into a bloody round of score-settling and communal violence. Former Education Minister William Ruto and radio presenter Joshua arap Sang, who opposed Mr Kibaki in 2007, are also to stand trial in a separate case. Some human rights groups have been calling for Mr Kenyatta, who also serves as the country’s finance minister, and Mr Muthaura, the cabinet secretary, to resign. “The suspects are appearing in their individual capacity. The government cannot speak on their behalf on what to do and what not to do,” Kenya’s Daily Nation newspaper quotes Attorney General Githu Muigai as saying. He said the government would make a decision on whether the two should step aside after the appeals process was over. The BBC’s Caroline Karobia in the capital, Nairobi, says the suspects are allowed to appeal but ICC rules do not guarantee that their request is heard. Mr Kenyatta and Mr Ruto both have presidential ambitions – but it is not clear if the laws of Kenya will allow them to run in the polls due next year, she says. Kenya’s new constitution says holders of public office should be beyond reproach as far as ethics are concerned and rights groups are preparing to go to court to get an interpretation to see if this should include those facing trial. Kenya’s government has been lobbying for the cases to be dropped – a position endorsed last year by the African Union. Mr Muigai also unveiled a team of legal experts who will advise the government on the ruling by the ICC judges. On Monday, the ICC judges did not confirm the charges against former Industry Minister Henry Kosgey or former police chief Hussein Ali. The ICC’s prosecutor, Luis Moreno-Ocampo, has said he will not appeal against this decision, but will continue to investigate the two and will present any new evidence he finds against them to the court’s pre-trial chamber. INDIANAPOLIS — A 12-year-old girl with a severe case of scoliosis is getting a second chance at life after undergoing surgery at an Indianapolis hospital. Salma Suleman, who lives in Nairobi, Kenya, couldn’t walk more than 10 feet at a time because of the drastic curve of her spine, which also threatened to crush her lungs and heart, RTV6’s Tanya Spencer reported. The Chetah Gives Back Foundation in San Diego brought Suleman to the United States, and the Peyton Manning Children Hospital at St. Vincent offered to perform the risky surgery for free. “Her curve was so severe, when you looked at her from behind, her shoulder blade was actually touching her hip,” said surgeon Dr. David Schwartz with OrthoIndy. He said Suleman’s scoliosis was the most severe case he’d seen in his 17 years as a spine surgeon. Schwartz performed the nearly 12-hour surgery, with Suleman receiving 15 levels of fusion. Three weeks later, she can stand up straight, walk without pain and lift her arms. The surgery has also given her a new outlook on life. “I feel happy,” Suleman said. “I was losing my hope, but he’s brought my hope back.” Suleman was released from the hospital Monday. She’ll spend about a month in rehab in San Diego before heading home, where Schwartz plans to visit her. Suleman said she wants to be a surgeon someday so she can help children the way Schwartz helped her. WASHINGTON, Jan 24- The United States on Monday urged Kenya and its people to continue cooperating with the International Criminal Court (ICC) which ruled that four key Kenyans should be tried over post-election unrest. “We believe accountability for the 2007-2008 post-election violence is critical to ensuring Kenya’s democracy, peace, and long-term stability,” State Department spokeswoman Victoria Nuland said in a statement. The Hague-based ICC said Monday that charges of crimes against humanity had been confirmed against presidential candidates William Ruto and Uhuru Kenyatta over deadly unrest that erupted following a disputed 2007 presidential vote. 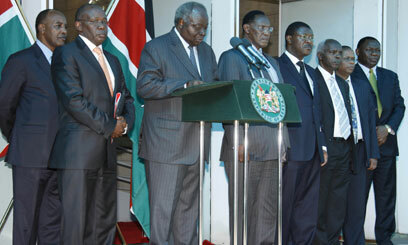 Ruto and Kenyatta are allies of Kenya’s President Mwai Kibaki. Two other Kenyans, radio host Joshua arap Sang, 36, and Francis Muthaura, 65, the head of Kenya’s civil service, will also face trial. Ruto and Sang were opposition supporters in 2007. More than 1,100 people died in the post-election violence, shattering Kenya’s image as a beacon of regional stability. While Washington makes no judgment as to the innocence or guilt of the four suspects, it calls on Kenya to live up to the spirit of its new constitution “which embraces transparency, accountability and integrity,” Nuland said. “We urge the Kenyan government, the people of Kenya, and the individuals involved to continue to cooperate fully with the ICC proceedings and to remain focused on Kenya’s future, especially through implementation of the reform agenda,” Nuland said. “The United States is committed to continuing to support Kenya’s ambitious reform process as Kenya looks ahead to its first national elections under the new constitution,” Nuland said. Britain has deported over 1,670 Kenyans, including 107 children for contravening various immigration rules since 2006, an official of the UK Border Agency, Mr Paul Feakins told The Standard. Responding to a written request for the information, under the Freedom of Information Act 2000, Mr Feakins, said that 277 Kenyans including 21 children, were deported from Britain in 2006. Some 330 Kenyans, including 22 children, were sent home in 2007 while 362, including 23 children, were thrown out from the UK in 2008. The highest single number of Kenyans deported from London was done in 2009 when 375 Kenyans, including 27 children were returned. The lowest number of Kenyans deported from the UK was 328 Kenyans, which included 14 children in 2010. Mr Feakins said that the number of Kenyans deported so far could be much higher since his information provided did not include the 2011 figures, which were still being worked out. The Standard had sought to have a conclusive statistics data of all the Kenyans convicted by the UK courts for the last five years, those still in the UK prisons, number of children with the Kenyan nationality being held in prison or correctional facilities. The Newspaper also sought to know some of the most serious crime ever committed by the Kenyans in UK, the number of those deported for the last five years for immigration purpose, number of adult Kenyans sent packing from Britain for committing crime, number of children deported from the UK, and number of Kenyan unaccompanied children being held in the immigration facilities. But Mr Feakins, however said that his department didn’t have conclusive statistics data of all the Kenyans convicted by the UK courts for the last five years, or those still in prisons, and other correctional facilities saying that such information could only be obtained from the UK’s Ministry of Justice. Mr Feakins said that it was in the public interest that the UK’s Border Agency remove as many foreign national offenders as quickly as possible in order to minimise the burden on the public purse by keeping such people in custody as well as considering whether such individuals risked re-offending if allowed to remain in Britain. Mr Feakins declined to release more information on the deportees citing Freedom of Information Act.